• Organic source of soy isoflavones which have been certified free of genetically-modified (GMO) materials. An organic source also means that the soy crops from which the isoflavones are obtained are not treated with any pesticides. • Double standardised soy isoflavones with standard content of soy isoflavones (40%) and standardised contents of genistein and diadzein (20mg respectively) for optimal hormonal benefits. • Active form: Contains the active aglycone form of soy isoflavones which are immediately bioavailable. • Safe & Selective: Displays selectivity towards estrogen receptors-beta located in the brain, bones and heart. Selective soy isoflavones will not dock estrogen receptors-alpha located in breast or uterine tissues to cause harm. There are many types of estrogen compounds including xenoestrogen (e.g. bisphenol-A as found in animals), metalloestrogen (e.g. cadmium) and estradiol (as found in HRT). The main reason why chemically-derived estrogens have been linked to the progression of cancer is because it has strong binding effects to estrogen receptor sites located in breast and uterus tissues especially. When these chemical estrogen compounds stimulate the tissues over time, cell changes can lead to the development of cancer. Nuvafemme® is made up of generally two main phytoestrogens (plant estrogens), genistein and diadzein sourced from organic soy isoflavones. These are naturally derived and untampered from its balanced natural composition. • The soy isoflavones in nuvafemme® are weak agonists at estrogen receptor sites. It is 1000 times less potent than estradiol which means that it can impart desirable estrogenic benefits without the side effects of chemically-derived estrogens. • The soy isoflavones in nuvafemme® are selective towards ß (beta)-estrogen receptors located in the brain, heart and bones and not towards α(alpha)-estrogen receptors located in breast and uterine tissues. 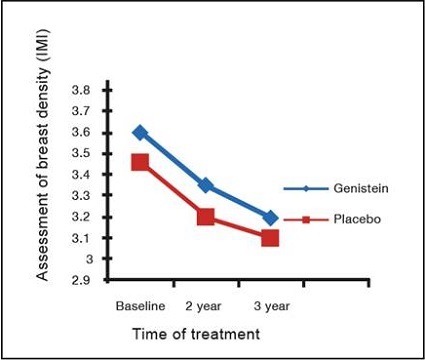 • Research as published in the Journal of Clinical Endocrinology & Metabolism 2008 showed that women who took genistein for 3 years experienced positive effects on bone formation without changes to mammographic breast density or endometrial thickness (no changes to breast or uterine tissues). Reference: Marini H et.al. 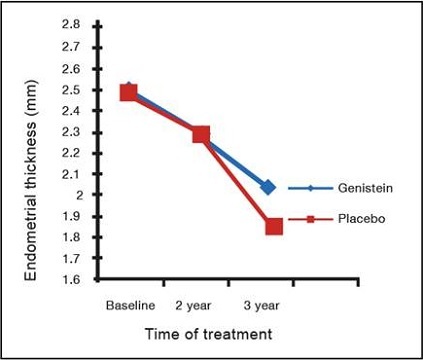 Breast safety and efficacy of genistein aglycone for postmenopausal bone loss: a follow-up study. J Clin Endocrinol Metab. 2008 Dec;93 (12):4787-96. Soy isoflavones have been identified as dietary components having an important role in reducing the incidence of breast and prostate cancers in Asian countries. The two main isoflavones which has been studied include genistein and equol, which is a bio-derivative from the probiotic metabolism of diadzein in the body. • As an antioxidant to neutralize reactive oxygen species known to cause mutagenesis and carcinogenesis. • As a phytoestrogen, to lower the total lifetime exposure of the body to overtly potent estrogen compounds including estradiol produced in the body (which can cause hormone-relate cancer) by competing for estrogen receptor sites. • As an inhibitor of several cellular proteins critical in mediating the pathogenesis of cancer namely PTK, Topo II, PI and MRP. In vitro studies have demonstrated genistein’s actions to induce cancer cell death, inhibit cancer cell growth, prevent cancer cell division and anti-angiogenesis. When the ovaries (the main producers of the hormone estrogen) are surgically removed, women will enter into surgical menopause. Women who only have their uterus removed will not go into surgical menopause as their ovaries are still making estrogen. They'll go into menopause naturally when they get older, although sometimes this happens a bit earlier than usual. As estrogen plays a key role throughout the body affecting the brain, the bones, the skin, the heart, and blood vessels, the sudden drop in estrogen upon surgery can lead to menopausal symptoms that can be quite severe. If considering HRT after surgical menopause, women who only have the ovaries removed need to be aware that they will need a preparation with both estrogen and progestin. This is because chemically-derived estrogens alone can increase the risk of cancer in the uterus. The addition of the progestin ameliorates the risk. Alternatively, nuvafemme® can be considered after the procedure instead of HRT as a way to counteract the supply of estrogen lost. A higher dose (of up to four tablets daily in divided doses) may be required. Nuvafemme® can be taken even by women who have not undergone a hysterectomy as it does not pose a risk to uterine tissues unlike HRT. Hormones play an important role in fat metabolism. Hydrolysed genistein as contained in nuvafemme® has been shown in clinical studies to be able to prevent fat formation, reduce fat pad weight (belly fat) and inhibit fat accumulation. With genistein, women will find that their weight management program will be more responsive as hormone levels are better regulated. Nuvafemme® is not a drug or chemical whose actions are almost immediate. It will take at least 6 – 8 weeks for the effects of nuvafemme® to be felt. Increase water intake is recommended especially in the first two weeks of starting nuvafemme® to help metabolic processes progress smoothly. Yes. 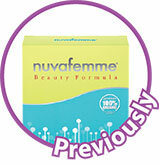 Nuvafemme® was previously available in a different packaging and pack size. The new packaging facelift comes in a 60 tablet pack size to better fit a one-month dosing duration. The same organic hydrolysed genistein active ingredient however remains unchanged so consumers will derive the same uncompromised proven benefits. As a phytoestrogen-antioxidant-metabolic regulator, nuvafemme® can be taken by women from age 16 years and above to help manage hormonal imbalances in a safe and natural way. Hormonal imbalances can happen at any time throughout a woman’s life (refer to graph). As a brand who understand the needs of women, nuvafemme® is known for bringing awareness to the subject of hormonal imbalance in women especially during perimenopause (commonly known as midlife). Perimenopause is a little known stage in womanhood although its effects can be very distressing towards a woman’s physical, physiological and emotional well-being. This stage is probably the time when women will require the support of natural isoflavones such as nuvafemme® more. Nuvafemme® is also used with confidence by women who have already experienced menopause to help manage the associated symptoms. What is so different about nuvafemme? I heard that estrogen compounds including phytoestrogens can cause cancer. I am particularly concern about the risk of having breast cancer. Is nuvafemme® safe? Can soy isoflavones protect against cancer? I have undergone a hysterectomy and have had my ovaries removed too. Can I take nuvafemme®? How does nuvafemme® help with fat management? How soon can I expect results with nuvafemme®? Did nuvafemme® go through a packaging change? I notice that I am experiencing some hormone imbalance issues. My periods don’t seem to be regular and even small things seem to irritate me. I am 26 years. Is Nuvafemme suitable for younger women?